If you are the one hosting a party, want to set up a real live casino at your desired place to let your guests enjoy the evening. BAM Casino parties is one such company that is able to setup casino gaming, offer casino rentals at your doorsteps in San Francisco, Bay Area. After Roulette, Craps, Blackjack now its time to learn How to play Texas Hold-em Poker? Texas Hold’em poker is one of the most popular poker game with its numerous variations to play. This unique card game is played by maximum number of people in the world where each player has 2 private cards and 5 open cards. The player gets two cards that are not visible to the other players and are called as ‘hole cards’. The other five cards on the table are called as ‘community cards’. The game is played in a clockwise direction around the table. Button: Button is a nickname for the player acting as the dealer in current hand. Check: Similar to a call but there’s no money to bet. If there is no raise preflop, the big blind may check. All-In: A player puts all of his or her remaining chips into the pot while playing. 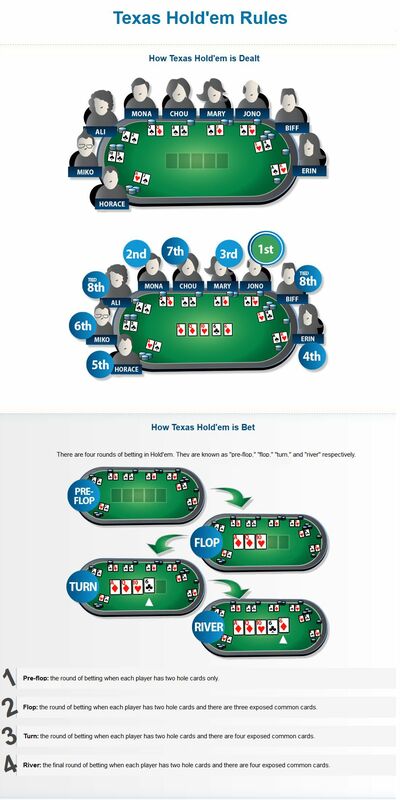 Preflop: Anything that occurs before the flop is known as preflop. River: The final (5th) community card that is played; also known as fifth street. Showdown: When players reveal their hands to discover the pot’s winner. Turn: The fourth community card out of those 5 cards played; also known as fourth street. Let’s start with the betting rules for the game and these are same as you follow in the live texas Hold’em Poker game. The button/player moves in a clockwise direction each time after a game and the immediate player in the left to the previous dealer now becomes a new dealer. As the first game starts, that player automatically becomes a dealer who is nearest to the left of the dealer in the game and is not disconnected. In a heads-up game a dealer becomes small blind. As soon as the dealer is chosen and marked with a dealer button, the next betting round starts according to the rules of the game variant. A player who is sitting left to the dealer puts in a small blind whereas the one sitting next to him puts on a big blind before the hole cards are played. The blind amounts are already decided before for each game depending on the stakes, the big blind is always double the amount of small blind. A player can take 4 actions for placing the bet in any round of Texas Hold’em poker. Raise: Raise is made in order to increase the bet amount in the betting round. Check: This is done to continue the game further without placing any bet. The action can be taken by any player in the game but only if he has already matched the biggest bet on the table or if none of the player has yet opened the betting round. Fold: Action is taken by the player to leave this ongoing game by just surrendering the hole cards to the dealer and wait for the next game. What are the Variants of Texas Hold’em Poker Game? 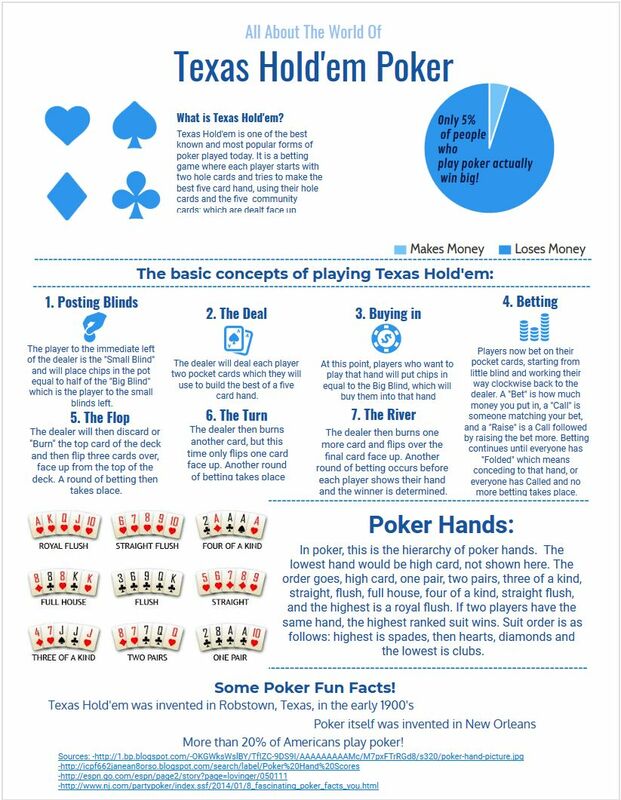 Texas Hold’em Poker is all about making the best 5 card combination from the 7 cards at the disposal of each player. A player can use one, both or none of his hole cards to make this best hand. The game has following variants depending on the betting rules. No Limit Texas Hold’em – There is no limit on betting. A player can bet as much as he wants to bet while playing. Fixed Limit Texas Hold’em – There is a proper limit on the amount that a player can bet. 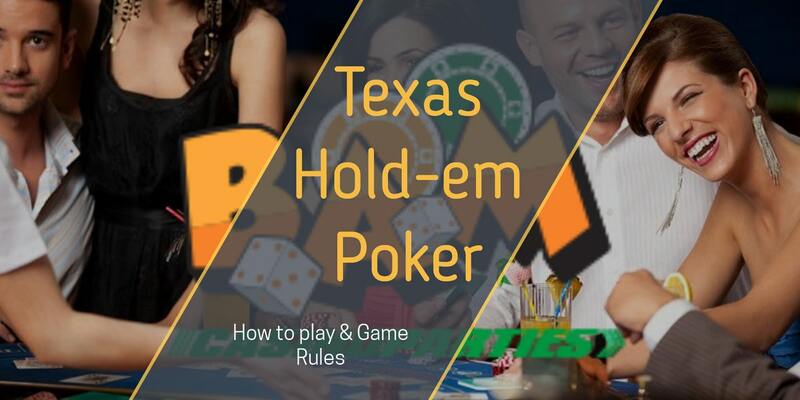 Pot Limit Texas Hold’em– A player can bet any amount up to the size of the pot. So, you know about casino games and want to enjoy it with your guests. The selection is really good to pick Texas Hold’em Poker, now you have to get hold of some equipment. Like any other poker game the styles and strategies of the game can get complex in the later stages. A game is much focused on the betting side and the main aim is to obviously win the game. Okay, now everything apart, let’s know about how to play the game. A game is played with 10 players on playing table. Take into note that win as many chips as you can and one pot at a time. You can win a pot by having the best hand or by having all other players fold before the showdown. Setup – To play the game all players should take their seat and start playing while knowing the rules. Blinds – The game is played with a small and big blinds. The big blind is double the small blind. Small blind is the player next to the dealer and big blind is a player to the left of the small blind. Deal Hole Cards – The game is played in the clockwise direction. The dealer will deal one card face down to the player to his/her left and then will continue further with the players having 2 cards face down in front of them. These cards are known as hole cards and now when all the players have with them, the first betting process begins. The River – After this round of betting the last card is placed face up and is called the River. The last betting round begins and repeat step 4 again. Game Continues. The play continues till one player has all the chips in a play. We want to let you know about the strategies that you can use to have a win win opportunity while playing the game live or online. We will discuss few strategies that can help you. If you haven’t played from a long time, ensure that people know you haven’t, only in that case you can get a lot of credit. If in any case others don’t realize that you haven’t played from a long time then you can’t be benefited from it. Need not to say this, if you want to entertain your guests with a fun loving game of Casino just contact BAM Casino parties, a well known brand for creating real life casino environment at your desired places. Are you Planning your next big poker party or casino night San Francisco? Looking for a fun idea or theme for your birthday party, prom party or grad night? Want to add some excitement to your company party or corporate event? Add some electrifying casino night entertainment with BAM Casino Parties. Let one of our casino party experts help you plan a memorable casino event that your guests will be talking about for days to come!